← Happy Spring! Here are a few activities for your calendar! As noted earlier, the first-ever Seattle Hub-a-thon, begins tomorrow and continues through Saturday, April 17th and 18th. 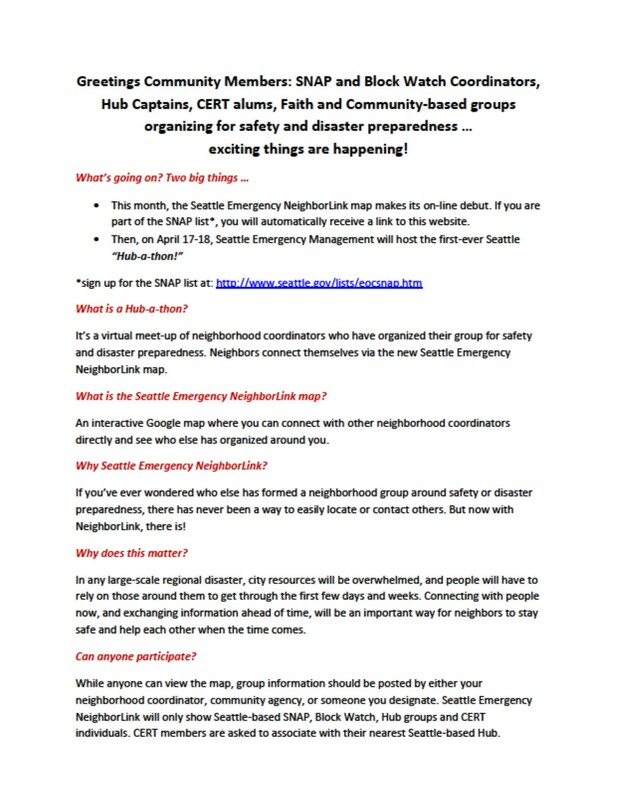 The objective is to create a comprehensive map of Seattle hub locations and other neighborhood groups that have an interest in emergency preparedness. 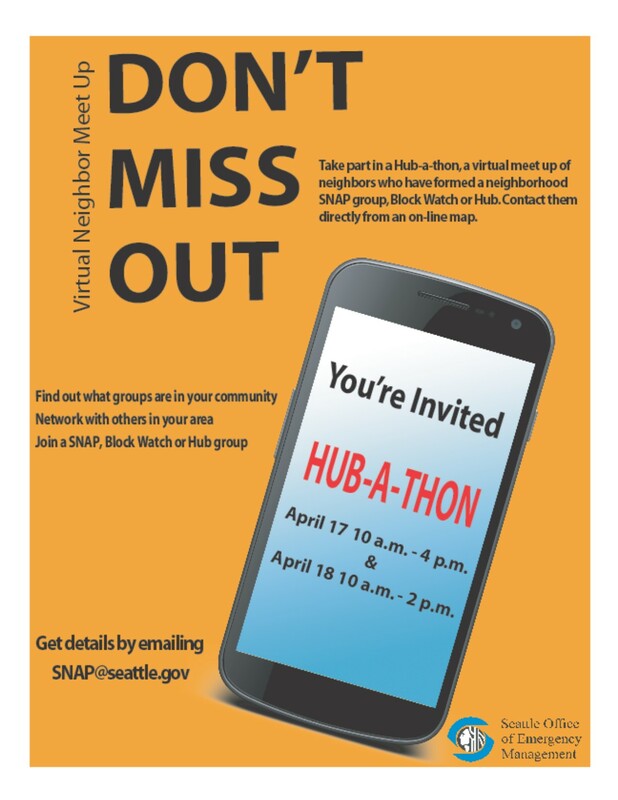 We’ve received updated information about the Hub-a-thon event from Debbie Goetz at the Seattle OEM, including a flyer and a FAQ, and have included those below. Make your mark on preparedness! The new Seattle Emergency NeighborLink Map is up and running! The first-ever Seattle Hub-a-thon takes place this Friday and Saturday, April 17-18, 2015. No need to wait, you can start participating now. Find the Seattle Emergency NeighborLink Map on the Home Page. Click the form for SNAP, Block Watch, Hub or CERT below the map. Submit your info and watch for your group to show up on the map during the April Hub-a-thon! Stop by the American Red Cross office at 1900 25th Ave S. anytime between 10 a.m. – 4 p.m. Friday, April 17, or 10 a.m. – 2 p.m. Saturday, April 18. We will enter the information into the computer for you. Or call 206-684-0517 during Hub-a-thon hours, and we will take your information over the phone. Note: We’ve added their map-in-progress to our West Seattle Be Prepared website; you can find it on the Seattle Community Hubs (citywide) page. They’ve integrated our West Seattle emergency communication hubs map, as well as included locations for other Seattle emergency hubs along with locations of other preparedness-related neighborhood groups (SNAP, CERT, Block Watch). 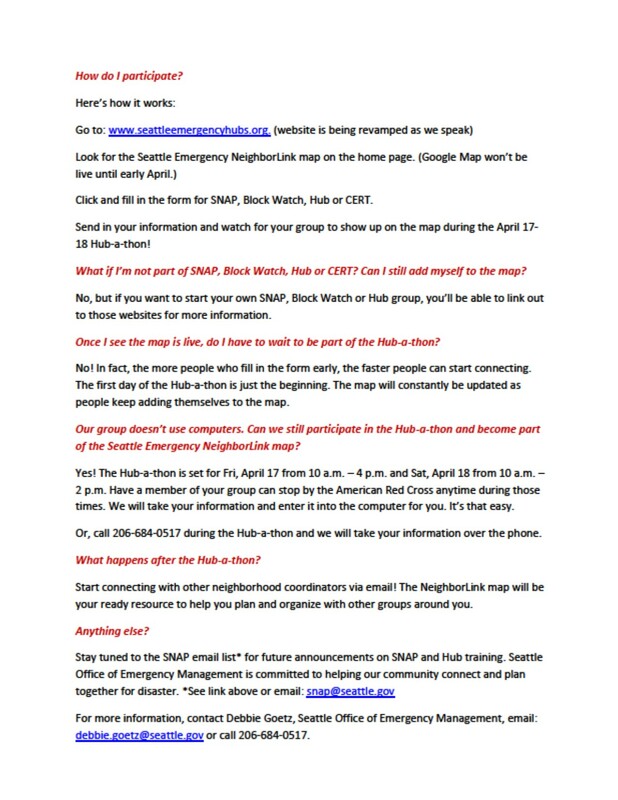 This entry was posted in Announcements and tagged Hub-a-thon, Seattle Emergency NeighborLink Map, Seattle Office of Emergency Management. Bookmark the permalink.